Formerly high-flying growth markets such as Russia and Brazil have disappointed. Even after this year’s recovery, their H1 sales were still 35% – 39% below their 2011 peak. Growth in the mature markets of the USA, Europe and Japan has only been achieved via $tns of stimulus programmes, which have left all 3 areas with vast debt burdens. Now, of course, higher interest rates are causing sales to slow again. Only China – and India, with its very young population and relatively cheap prices – has seen steady sales growth. The sanctions couldn’t have come at a worse time for the US industry, where domestic steel and aluminium users are already suing the Administration over Trump’s earlier tariff decisions. Higher prices will only accelerate the current decline in domestic auto demand, which is being hit by 2 major negative trends. But in 2001, the oldest Boomers became 55, when people leave the Wealth Creator 25 – 54 age group which drives economic growth. 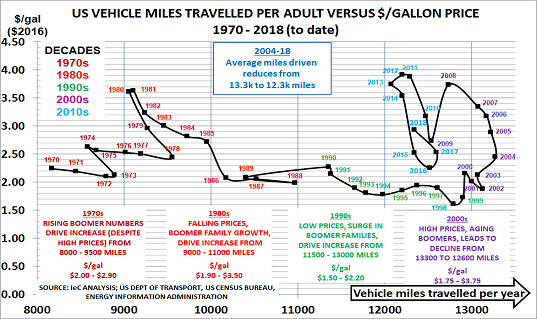 Average miles per adult peaked in 2004 at 13.3k miles and have since fallen by 1k to the current 12.3k level. Mileage is back at 2011 levels, when gasoline prices were a third higher at nearly $4/gal. The issue is that the ageing Boomers no longer have to drive to work each day, or provide a taxi service for their children. And car ownership is no longer a key “rite of passage” for younger Millennials. New business models (eg Uber/Lyft services and car-sharing) are far more affordable, given the high costs of car purchase and insurance. 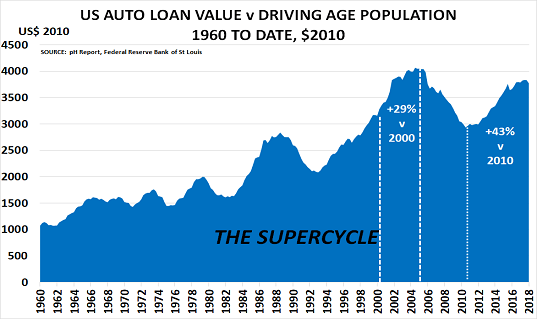 The QE bubble was great news for US auto sales at the time, as was subprime. But now. interest rates are rising again. 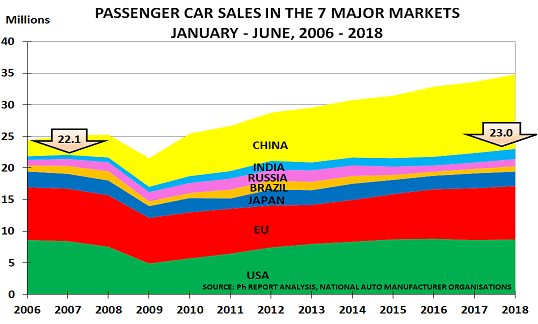 “Prices for new cars are on the rise, and as leasing continues to grow in popularity, prices continue to go down in the used car market. Put simply, used cars are often the most realistic purchase for car shoppers. As with the stimulus programmes, they will instead simply make it more difficult to develop the new policies needed for success in today’s New Normal world.